The primary concern in any busy pediatrics practice is to provide timely, accessible care to sick patients and in many cases, reassure worried parents. To keep up with demand, most pediatricians offer phone consultations to parents and their sick children. While this solution is effective in providing responsive care, phone calls may be taxing staff efficiency and the practice’s bottom line. Telemedicine offers a solution to this problem. Pediatricians use telemedicine software to quickly and conveniently provide face to face interactions for non-urgent patient requests and triage phone calls. The combination of high-quality care and convenience makes telemedicine and pediatrics offices a perfect fit. Telemedicine software can be use for many appointment types. Some of the most common include: routine follow-up visits, medication adjustments, and minor urgent care. Video visits also allow practices to see more patients in the day and save the waiting room for those who need it most–thus increasing practice efficiency. Most pediatricians use video visits for routine, non-emergency issues. A good example would be gastroenteritis – perhaps a patient is vomiting and a concerned parent calls in for advice. What may have been a phone call at best billed at $25, or worse, unbillable, is now billed at the in person rate. The staff can triage the call using the same protocols they would for a phone call, and if determined to be appropriate for telemedicine, they can schedule a face to face video visit based on the physician’s availability. Now the practice is collecting around $60-$70 for a consultation. On top of that, both parties benefit from a face to face interaction. Worried parents are relieved that the doctor has seen their child, and the physician is assured they didn’t overlook a potentially serious condition. Pediatricians often have to rely on parents reporting self-reported symptoms on behalf of a sick child. Discerning what is a minor condition that requires some simple counseling versus a potentially serious condition is problematic without a visual encounter. On top of that, concerned parents may worry that the doctor may be overlooking something without laying eyes on the child. Converting blind phone calls into video visits instantly adds value to patient satisfaction and physician practices. Face to face interactions allow physicians to quickly see reported symptoms and offer reassurance or treatment plans to parents. What’s not appropriate for video visits? Not everything is appropriate for telemedicine. Serious conditions such as dehydration, altered mental status, or respiratory distress, are generally not suitable to be treated via telemedicine as they can be symptoms of potentially serious conditions. However, a video visit gives the physician an ability to visually confirm these conditions like never before. In a situation where a parent describes their child as “lethargic”, a physician can now confirm difficulty breathing, and recommend that the child be seen in person immediately. While not all conditions are appropriate to be treated over telemedicine, it is a powerful triage tool. We would love to discuss further how you can easily offer video visits in your practice. 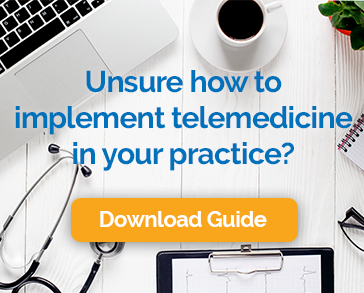 If you’d like to learn more check out our blog on how to select a telemedicine software or schedule a demo for a time to chat.